Discussions Magazine Music Blog: KENNY G/An Evening Of Rhythm & Romance: DVD and Blu-Ray available 10/6/2009! 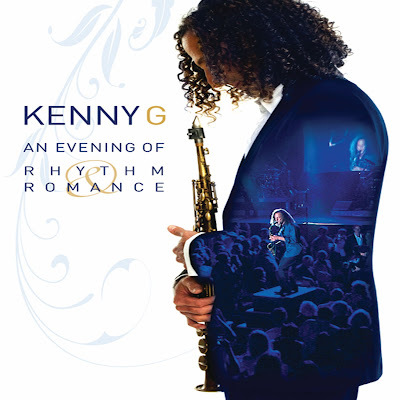 KENNY G/An Evening Of Rhythm & Romance: DVD and Blu-Ray available 10/6/2009! Kenny G is a Grammy® award-winning saxophonist with global album sales in excess of 50 million copies. This new concert DVD was filmed in late 2008 at Humphreys By The Bay in San Diego on the tour in support of his most recent studio album Rhythm & Romance. The show features classic Kenny G tracks alongside cover versions, all delivered in his inimitable relaxed and intimate style that make him the true “King of Smooth Jazz”. Includes “Havana” & “G-Bop” plus his signature tune and worldwide hit “Songbird.” Cover versions of James Blunt’s “You’re Beautiful,” Louis Armstrong’s “What A Wonderful World,” and Average White Band’s “Pick Up The Pieces” complete the set. Bonus features for this release include a revealing interview with Kenny G and a trio of Christmas tracks: “Deck The Halls / 12 Days Of Christmas,” “White Christmas,” and “Santa Claus Is Coming To Town.” Exclusive to the Blu-Ray are rehearsal takes of two of these Christmas tracks. I just receive this as a gift for my birthday--along with a Panasonic bd 80 Blue Ray Player. This was on my "To Purchase" list because not only I'm a Kenny G Fan, but I also attended this concert in San Diego with my son who is a Saxophone player. The venue in San Diego was Humphrey’s By The Bay, which is outdoors, and not my favorite type of concerts to attend, but, it was Kenny G and I scored the Tickets on a radio contest. The house was packed and we arrived there just in time to grab a bite to eat and find our seats. It was on the cold side, however, luckly for us we brought a lite jacket. We sat on the far left side of the concert, facing the stage and had a good view. ( any seat was a good seat) about 20 rows back. We were informed at the beggining of the concert that it was being filmed in HighDefinition and a Blue Ray dvd was going to be made of the concert. Well, having said that, I was expecting the blue ray to be, atleast, decent.